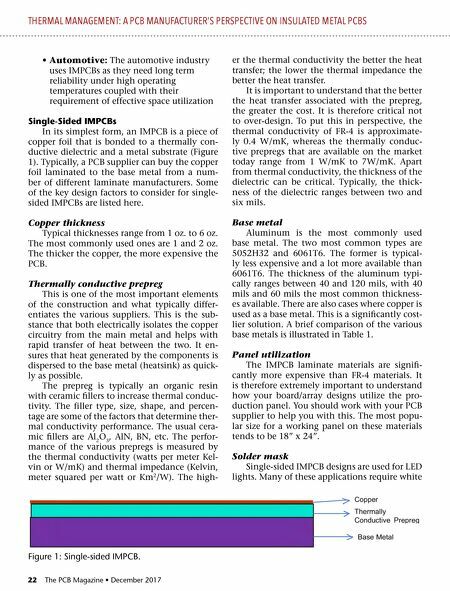 22 The PCB Magazine • December 2017 • Automotive: The automotive industry uses IMPCBs as they need long term reliability under high operating temperatures coupled with their requirement of effective space utilization Single-Sided IMPCBs In its simplest form, an IMPCB is a piece of copper foil that is bonded to a thermally con- ductive dielectric and a metal substrate (Figure 1). Typically, a PCB supplier can buy the copper foil laminated to the base metal from a num- ber of different laminate manufacturers. Some of the key design factors to consider for single- sided IMPCBs are listed here. Copper thickness Typical thicknesses range from 1 oz. to 6 oz. The most commonly used ones are 1 and 2 oz. The thicker the copper, the more expensive the PCB. Thermally conductive prepreg This is one of the most important elements of the construction and what typically differ- entiates the various suppliers. This is the sub- stance that both electrically isolates the copper circuitry from the main metal and helps with rapid transfer of heat between the two. It en- sures that heat generated by the components is dispersed to the base metal (heatsink) as quick- ly as possible. The prepreg is typically an organic resin with ceramic fillers to increase thermal conduc- tivity. The filler type, size, shape, and percen- tage are some of the factors that determine ther- mal conductivity performance. The usual cera- mic fillers are Al 2 O 3 , AlN, BN, etc. The perfor- mance of the various prepregs is measured by the thermal conductivity (watts per meter Kel- vin or W/mK) and thermal impedance (Kelvin, meter squared per watt or Km 2 /W). The high- er the thermal conductivity the better the heat transfer; the lower the thermal impedance the better the heat transfer. It is important to understand that the better the heat transfer associated with the prepreg, the greater the cost. It is therefore critical not to over-design. To put this in perspective, the thermal conductivity of FR-4 is approximate- ly 0.4 W/mK, whereas the thermally conduc- tive prepregs that are available on the market today range from 1 W/mK to 7W/mK. Apart from thermal conductivity, the thickness of the dielectric can be critical. Typically, the thick- ness of the dielectric ranges between two and six mils. Base metal Aluminum is the most commonly used base metal. The two most common types are 5052H32 and 6061T6. The former is typical- ly less expensive and a lot more available than 6061T6. The thickness of the aluminum typi- cally ranges between 40 and 120 mils, with 40 mils and 60 mils the most common thickness- es available. There are also cases where copper is used as a base metal. This is a significantly cost- lier solution. A brief comparison of the various base metals is illustrated in Table 1. Panel utilization The IMPCB laminate materials are signifi- cantly more expensive than FR-4 materials. It is therefore extremely important to understand how your board/array designs utilize the pro- duction panel. You should work with your PCB supplier to help you with this. The most popu- lar size for a working panel on these materials tends to be 18" x 24". 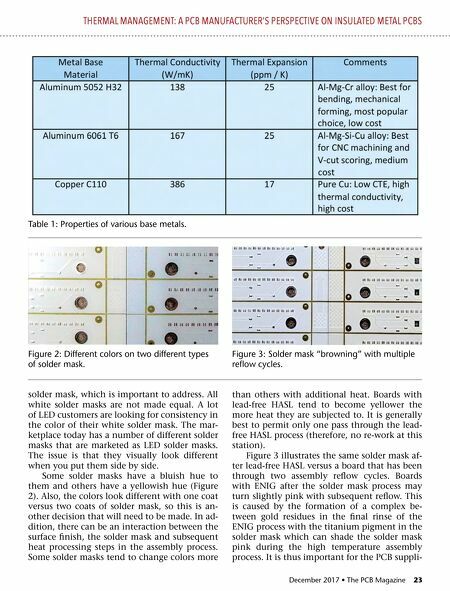 Solder mask Single-sided IMPCB designs are used for LED lights. Many of these applications require white THERMAL MANAGEMENT: A PCB MANUFACTURER'S PERSPECTIVE ON INSULATED METAL PCBS Figure 1: Single-sided IMPCB. Column — Getting the Heat Out!